These fictional stories are not a reflection of any person, alive or dead. However, in their own way, they are representative of all of us. From our earliest youthful memories we have all, at one time or another, wondered about death and dying. 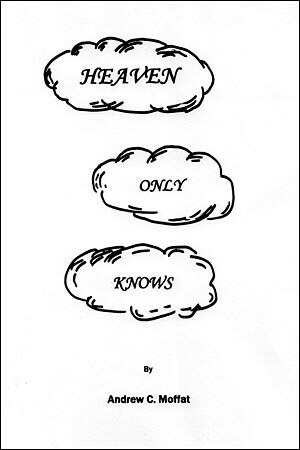 “Heaven Only Knows” — the title story of this book — is a speculative look at the transition from life to death, and all of the memories and love involved. Similarly, we have all wondered what it is like to grow old and to look back at our lives with honest criticism: to question what we have shared with our children — and what we have kept secret from them. What decisions we have made that proved to be lost opportunities — but were, in the long run, the best we ever made. Life is full of twists and turns and these stories lead us down some of those mysterious paths. He rolls over, as though to look about him — seeking his buddies. He hasn’t yet realized that he is no longer on the ground. That feeling he had of rising wasn’t just sensation — he actually did rise, and well above the ground. “Jesus, what are you doing to me? What is happening to me? Then he sees another body — but that is impossible. There were only four of them on patrol! Just as he had been trained to do, he does a rapid sweep with his eyes, sizing up the scene and orienting himself. “The stories play with your emotions from beginning to end. I found myself wondering what theme would be in the next story, which intrigued me enough that I finished the whole book in one sitting.